Bagan formerly Pagan, is an ancient city in the Mandalay Division of Burma. Formally titled Arimaddanapura or Arimaddana (the City of the Enemy Crusher) and also known as Tambadipa (the Land of Copper) or Tassadessa (the Parched Land), it was the ancient capital of several ancient kingdoms in Burma. It is located in the dry central plains of the country, on the eastern bank of the Ayeyarwady River, 90 miles (145 km) southwest of Mandalay. UNESCO has unsuccessfully tried to designate Bagan as a World Heritage Site. The military junta (SPDC) has haphazardly restored ancient stupas, temples and buildings, ignoring original architectural styles and using modern materials that bear no resemblance to the original designs. Likewise, the junta has established a golf course, a paved highway, and built a 200-foot (61-m) watchtower in the southeastern suburb of Minnanthu. The ruins of Bagan cover an area of 16 square miles. The majority of its buildings were built in the 1000s to 1200s, during the time Bagan was the capital of the First Burmese Empire. It was not until King Pyinbya moved the capital to Bagan in AD 874 that it became a major city. However, in Burmese tradition, the capital shifted with each reign, and thus Bagan was once again abandoned until the reign of Anawrahta. In 1057, King Anawrahta conquered the Mon capital of Thaton, and brought back the Tripitaka Pali scriptures, Buddhist monks and craftsmen and all of these were made good use of in order to transform Bagan into a religious and cultural centre. With the help of a monk from Lower Burma, Anawrahta made Theravada Buddhism a kind of state religion, and the king also established contacts with Sri Lanka. In the 12th and 13th centuries, Bagan became a truly cosmopolitan centre of Buddhist studies, attracting monks and students from as far as India, Sri Lanka as well as the Thai and Khmer kingdoms. Among many other works, Aggavaṃsa's influential Saddanīti, a grammar of the language of the Tipiṭaka, would be completed there in 1154. In 1287, the kingdom fell to the Mongols, after refusing to pay tribute to Kublai Khan. Abandoned by the Burmese king and perhaps sacked by the Mongols, the city declined as a political centre, but continued to flourish as a place of Buddhist scholarship. The Payathonzu Temple is built in the Mon style. Mandalay Division is an administrative division of Myanmar. It is located in the center of the country, bordering Sagaing Division and Magway Division to the west, Shan State to the east, and Bago Division and Kayin State to the south. The regional capital is Mandalay. In the south of the division lies the national capital of Naypyidaw. The division consists of seven districts, which are subdivided into 30 townships and 2,320 wards and village-tracts. Mandalay Division is important in Burma's economy, accounting for 15% of the national economy. The Tibeto-Burman speaking Pyu were the first historical people to dominate the dry zone in central Myanmar that includes Mandalay Division as early as the 1st century AD. By the early 9th century, the Pyu were decimated in a series of wars with the Nanzhao kingdom from Yunnan. The Burmans, who had been migrating into the region from Yunnan since 7th century, founded a city of their own, Pagan, in 849. The Pagan dynasty slowly came to dominate the central zone over the next two centuries, and by the late 11th century, all of present day Myanmar. The Burmese language and script came to prominence with royal patronage of Pagan kings. After the fall of Pagan to the Mongols in 1287, parts of central Myanmar came to be controlled by a series of rulers: the Mongols (1287-c.1303), Myinsaing (1298-1312), Pinya (1312-1364), and Sagaing (1315-1364). In 1364, Ava kingdom led by Burmanized Shan kings reunified all of central Myanmar. Central Myanmar was under Ava's control until 1527, and under the Shans of Monhyin (1527-1555). Burmese literature and culture came into its own during this era. Central Myanmar was part of the Taungoo kingdom from 1555 to 1752. Parts of the region fell briefly to the Mons of Pegu (Bago) (1752-1753). 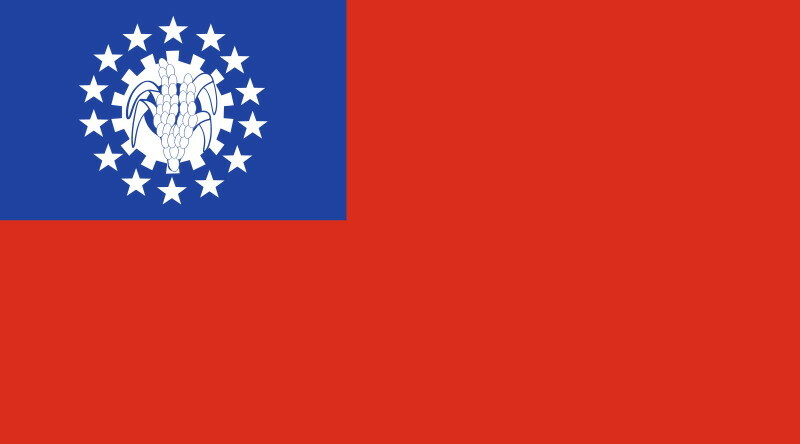 Konbaung Dynasty ruled the region until December 1885 when it lost all of Upper Myanmar in the Third Anglo-Burmese War. The British rule in Upper Myanmar lasted until May 1942 when the Japanese forces captured Mandalay during World War II. The British returned after the war and granted independence the country in January 1948. Upon independence, Mandalay Division ceded Myitkyina and Bhamo districts to the newly formed Kachin State. The majority of the population in Mandalay Division are Bamar (Burmans). In the Mandalay metropolitan area, however, a large community of Chinese, most of whom are recent immigrants from Yunnan, now nearly rival the Bamar population. A large community of Indians also reside in Mandalay. A dwindling community of Anglo-Burmese still exists in both Pyinoolwin and Mandalay. A number of Shan people live along the eastern border of the division. Burmese is the primary language of the division. However, Mandarin Chinese is increasingly spoken in Mandalay and the northern gem mining town of Mogok. Agriculture is the primary economical source of livelihood. Primary crops grown within Mandalay Division are rice, wheat, maise, peanut, sesame, cotton, legumes, tobacco, chilli, and vegetables. Industry, including alcoholic breweries, textile factories, sugar mills, and gem mines also exists. Tourism now forms a substantial part of Mandalay Division's economy, as it contains many historical sites including Mandalay, Amarapura, Bagan, Pyin U Lwin, Mount Popa, and Ava. Hardwoods such as teak and thanaka are also harvested. Educational opportunities in Myanmar are extremely limited outside the main cities of Yangon and Mandalay. According to official statistics, whose accuracy is highly doubtful at best, over 1 million students were enrolled in the division's 4467 primary and secondary schools in 2005. Although the statistics claim a 15% primary school dropout rate, the real rate is certainly far higher. Indeed, of the nearly 4500 schools, almost 4000 were primary or post-primary schools, while only 234 were middle schools and 227 were high schools. Still the division has some of the best institutions of higher education in Myanmar. As medical, engineering and computer studies are the most sought after in Myanmar, the University of Medicine, Mandalay, the University of Dental Medicine, Mandalay, Mandalay Technological University, and the University of Computer Studies, Mandalay are among the most selective universities in Myanmar. Other highly selective schools are Myanmar Aerospace Engineering University and military academies in Pyinoolwin: Defence Services Academy and Defence Services Technological Academy. The general state of health care in Myanmar is poor. The military government spends anywhere from 0.5% to 3% of the country's GDP on health care, consistently ranking among the lowest in the world. Although health care is nominally free, in reality, patients have to pay for medicine and treatment, even in public clinics and hospitals. Public hospitals lack many of the basic facilities and equipment. In 2005, Mandalay Division's public health care system had slightly over 1000 doctors and about 2000 nurses working in 44 hospitals and 44 health clinics. Over 30 of the so-called hospitals had less than 100 beds. Almost all of large public hospitals and private hospitals as well as doctors are in Mandalay. (These dismal numbers are believed to have improved by the advent of Naypyidaw as the nation's capital in 2006 although the level of improvement remains unreported.) The well-to-do bypass the public health system and go to private clinics in Mandalay or Yangon in order to 'get quick medical attention and high-quality service'. The wealthy routinely go abroad (usually Bangkok or Singapore) for treatment.